An ambulance races to the UF Health Shands E.R. carrying a man bleeding from a severe head wound he received in a fight. A quiet morning for staff ends with the suddenness of a light being switched off. Someone calls out, “Trauma alert!” Conversations stop. A cup of coffee is set aside. A trauma team quickly surrounds the arriving patient, and a well-rehearsed medical dance begins. An IV line is connected, and the man’s clothes are cut away. He is rushed to a CT scan, which shows there has been no brain damage. Karl Huesgen, M.D., an emergency room physician observing the action, counts at least 15 medical professionals attending to the man. “And that’s just for one person. Now, multiply that by 50 or 100 patients,’’ he said. Imagine, he said, what a mass casualty event would look like here. With mass shootings like those in Las Vegas in October 2017 and at the Pulse nightclub in Orlando in June 2016 becoming a macabre American norm, officials at UF Health and medical centers across the nation find themselves doing just that — imagining what a mass casualty event would look like at their facilities. They are continually reassessing and adapting their training and preparedness to handle such a crisis. Medicine is informed by collective experience, and a series of large-scale attacks in recent years has led to an evolution in how hospitals plan for the worst. “All of us have revised approaches to supply distribution, triage and patient distribution over the past years because of lessons learned from active shooter incidents that are fast-moving critical incidents,” A.J. Heightman, EMT-P, editor of the Journal of Emergency Medical Services, told MedPageToday. How does a medical facility ready itself for a deluge of hundreds of patients, some of whom may have life-threatening gunshot wounds, while ensuring that medical resources aren’t overwhelmed? Hundreds of skilled and compassionate caregivers at UF Health Shands, like their colleagues around the nation, train and plan for the unthinkable, knowing they may one day become the bulwark against a tsunami of wounded and panicked people. The UF Health Shands Trauma Center is a Level 1 facility, meaning it can handle any case regardless of severity. Officials here know the storm will inevitably come to their doorstep. 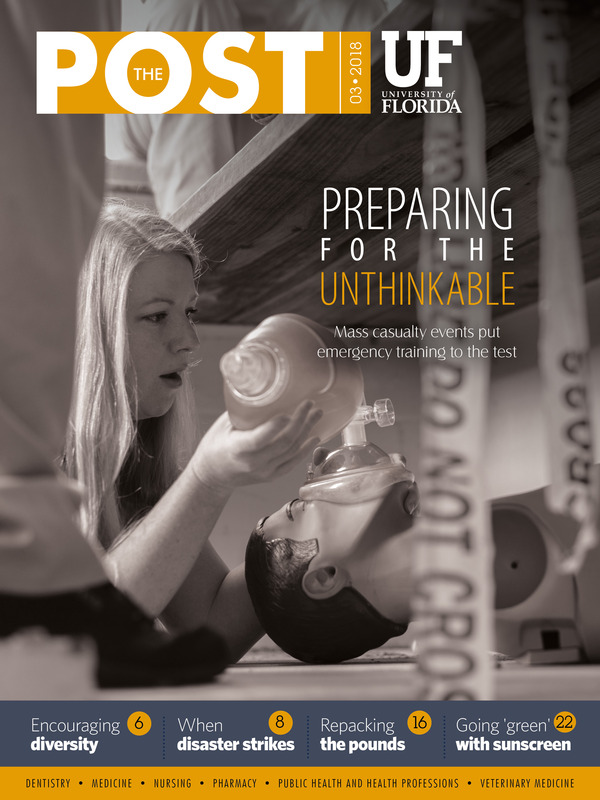 UF Health Shands and other hospital systems across Florida have been honing disaster-preparedness skills for decades, mostly in ways to handle traumas spawned by the hurricanes and tropical storms that regularly unleash their fury on the Sunshine State. Indeed, E.R. personnel already handle all manner of trauma daily, including gunshot wounds, said Huesgen, who also is a member of the UF Health Shands Emergency Preparedness Committee. But the damage one person can do to many others requires a specialized brand of readiness. That’s because its impact explodes at the doors of a hospital, instantly threatening to overload available resources. In the United States, most emergency rooms take an “all-hazards” approach to disaster preparation. That means preparing for anything from a mass shooting to the release of a hazardous substance in the derailment of a tanker car on a train. It could be an explosion that spreads radioactive debris, or a plane crash inside a packed football stadium. On the morning of Jan. 29, 2012, the crisis was not a drill. Hours before dawn that day, smoke from a lingering brush fire combined with thick fog and settled onto Interstate 75 across Paynes Prairie. Cars then semitrailers began braking in the zero visibility, and vehicles began plowing into them from behind. The resulting 25-vehicle pileup left 11 people dead and sent nearly two dozen more to area hospitals. Tyndall said that event, while a challenge, did not overwhelm the hospital. A plan for just such an emergency was already part of the facility’s toolbox. That capability, however, comes from many hours of practice. Hospital emergency personnel, often working with local law enforcement, paramedics and emergency management officials from Alachua County, routinely participate in mock disaster drills simulating a real emergency. The goal with training is to make the skills required to handle the emergency second nature. Training on a smaller scale also routinely takes place throughout UF Health Shands, from seminars and departmental sessions on disaster plans to drills involving active shooter scenarios and professional conferences where medical professionals who have experienced a mass casualty event share lessons learned. After the Pulse attack in Orlando that left 49 victims dead, physicians who helped treat the injured at that scene visited Gainesville to offer insight to UF Health personnel. Ebbin Spellman, the manager of safety and emergency preparedness at UF Health Shands, said officials like him are able to access a federal database that contains after-action reports of mass casualty incidents around the nation. “You can pull that information down and, instead of reinventing the wheel, you can look at what happened to them and say, ‘Wow, I never thought of that. We need to address that at our next drill or planning session,’ ” he said. Jason Jones, M.D., an assistant professor in the department of emergency medicine at the UF College of Medicine and an emergency room physician, said the training also helps workers control their own emotions. “Instead of having internal panic, your logic and training kicks in,” said Jones, who also serves as the medical director for Alachua County Fire Rescue. “The emotions are overwhelming later. All fourth-year UF College of Medicine students do a four-week emergency medicine clerkship. Students work 13 clinical shifts, including up to three shifts in the pediatric emergency room. The clerkship gives every medical student a useful knowledge base in emergency medicine, said Matthew Ryan, M.D., Ph.D., an emergency room physician, an associate professor and vice chair of education in the department of emergency medicine, and the emergency medicine clerkship director for the UF College of Medicine. An emergency medicine clerkship is also valuable because it gets medical students to think strategically during a crisis, he added. “If you have dozens of people who are victims of a bomb or a mass shooting, you have to think differently: How do we allocate our emergency room resources to do the most good? I think we have become more mindful of that because, unfortunately, mass casualty incidents have happened so frequently,” Ryan said. During the shootings last fall, Las Vegas hospital emergency rooms were pushed to the limit. Pediatricians were treating adult shooting victims. Obstetricians worked on trauma patients. In those kinds of situations, the challenge for physicians is to avoid getting lost in what Ryan calls a dense fog. “In any crisis, you need to remain focused, think about the task at hand and be very objective-oriented: Identify a problem, fix it and move to the next problem,’’ he said. Educators are realizing that all students in the medical fields, not just those interested in emergency medicine, need to be trained in how to handle such horrendous events. Last June, 80 undergraduate minority students took part in the inaugural UF Summer Health Professions Education Program, or SHPEP, initiative. The students were from around the country, and they were interested in career fields that included all six UF Health colleges. A centerpiece of the six-week program was a disaster drill involving a car bomb in one location and a backpack bomber in another. It featured “victims” with simulated wounds and blood, giving students the chance to experience the myriad injuries and challenges that can arise. By the end of the day, SHPEP students had learned from first responders how to identify the resources needed in a mass casualty event while practicing the triage system and other emergency responses. The drill emphasized elements of the U.S. Department of Homeland Security’s Stop the Bleed campaign. Launched in 2015, the nationwide awareness campaign encourages bystanders to become trained and empowered to help in an emergency before professional help arrives. Controlling hemorrhaging is especially important as research has shown that the top cause of preventable death at a shooting is blood loss. At UF Health Jacksonville, the trauma education team has also stepped up its community outreach to help during mass casualty, active shooter and everyday traumatic events. The hospital system’s Stop the Bleed training program teaches people how to save lives through bleeding control in case of a traumatic emergency. In 2017, the TraumaOne team trained 1,037 citizens of Northeast Florida and Southeast Georgia in Stop the Bleed, including businesses, schools, local media, law enforcement and various organizations. Also, in efforts to expand this valuable education into the community, TraumaOne has trained multiple EMS agencies and hospitals to become Stop the Bleed trainers. "If you have dozens of people who are victims of a bomb or a mass shooting, you have to think differently: How do we allocate our emergency room resources to do the most good?" — Matthew Ryan, M.D., Ph.D.
A mass casualty event can, in an instant, overburden a hospital’s emergency room. The first step is to clear space. Minor cases might be moved out of the E.R., while discharges are sped up to open more hospital beds. The E.R. also has two vehicles to take medical personnel to the scene, once it’s secure. This is another hard-earned lesson. Triage at a mass casualty scene can send the most critically ill patients to the hospital faster. “Even in the best of cases, EMS might be four or five minutes away,” Jones said. At the hospital, Jones and Huesgen noted, triage assumes the greatest importance. Under normal circumstances, a hospital will take all the time necessary and devote all possible resources to quickly treat a severely injured patient. That isn’t practical during a mass casualty event. Medical personnel, instead, focus on lifesaving efforts on the most critically injured. Research has shown, he said, that this cold calculus saves the most lives. Meanwhile, at the hospital, an emergency operations center is opened, directing the overall response and marshaling resources from throughout the medical system. Personnel get called in based on pre-existing lists, called A, B or C teams. Personnel now wear vests identifying their job — nurse, trauma surgeon respiratory therapist. This allows emergency personnel to quickly identify one another and eliminates a potential source of confusion, said Jones. Besides patients, another source of crowding in the E.R. are the volunteers who show up wanting to help. Tyndall said some of these nonemergency department physicians and trauma surgeons can be deployed to take care of the walking wounded, where trauma care isn’t needed. “In the triage algorithms, there are clearly patients who need a lesser level of care than others,” he said. All training scenarios and planning emphasize the one thing that has often broken down in prior events: communication. And that includes communication not just internally, but also with the community as things like rumor control can help assuage public anxiety. Spellman, the UF Health Shands safety and emergency preparedness manager, said it is important to recognize a disaster, in any form, is a community event. The hospital works in partnership with first responders, county and city emergency managers and political leaders. “You don’t get through something like this alone,” Spellman said, adding that repeated training and planning brings a tempered confidence. Emergency medical experts at UF Health and around the country recognize that the landscape has changed dramatically, and they must adapt. “I believe the biggest change in EMS has been the loss of, ‘It can’t happen here,’ to ‘Let’s be ready when it happens,'” Corey Slovis, M.D., of Vanderbilt University Medical Center in Nashville, Tennessee, told MedPage Today. At UF Health, Jones said, the teams believe they are up to the challenge.